I was pretty excited to stumble across this holiday-themed one-shot in time for the Mainlining season, but it’s probably too embedded in comics continuity for new readers to appreciate. It takes place in the midst of Civil War, although that plotline only comes up in the background. The main plot follows Bucky Barnes, as he tries to process his first real Christmas since the 40’s, and reflects on holidays then and now. The flashbacks are pretty fun, especially the contrast between the warm sepia tones and the blue-black colors of the modern scenes. 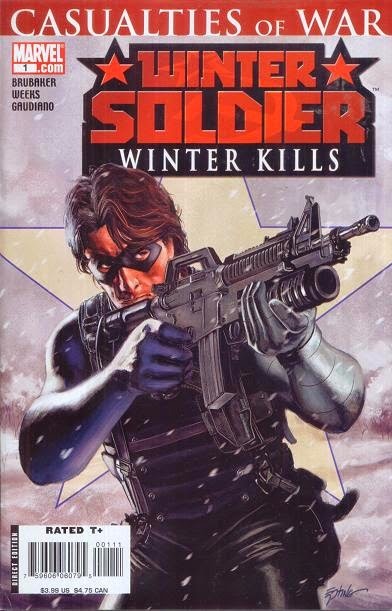 Bucky’s seasonal depression is interrupted by a summons from SHEILD, who ask him to stop a squad of Young Avengers - Hawkeye (Kate), Patriot and Vision - from accidentally blowing a SHIELD operation because of bad intel. They end up fighting a bunch of HYDRA goons, and Bucky acts toward the young heroes like the older professional that he is mentally, if not physically. Ed Brubaker’s writing, so the dialogue is snappy and satisfying, although I have to seriously question Kate’s clothing choices for snowy reconnaissance. That’s just sloppy design. One of the interesting things about this issue is that it isn’t just embedded in Civil War, but it significantly references the very early Marvel Universe. In the final scenes, Bucky meets with Namor to reminisce about the first Human Torch. If that last sentence made sense to you, look up this little melancholy tale.